This utility truck was slammed from behind by a 2003 Chevy Suburban (Suburban visible at right of photo). 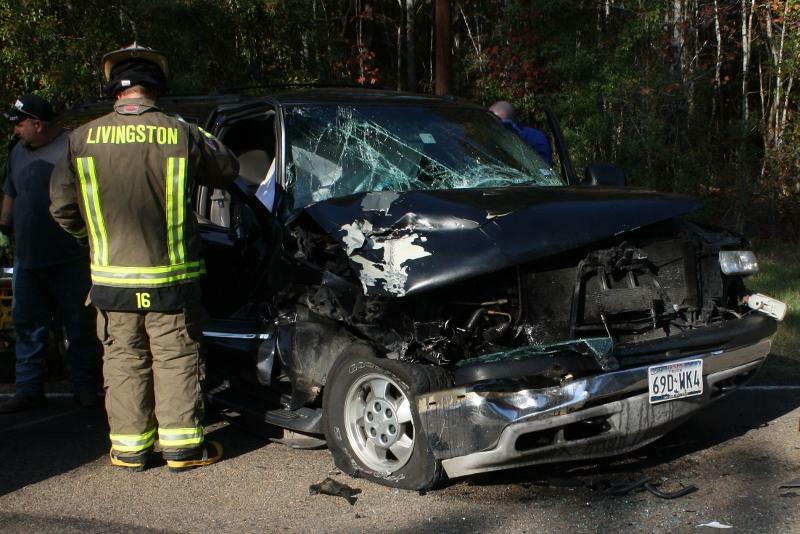 Failure to Control Speed, Driver Hits Utility Truck, BIG SANDY, December 18, 2011 - At approximately 2 pm on December 18, 2011, a black 2003 Chevy Suburban driven by Kenneth Matney, 42, of Livingston, was south-bound on FM-1276. Matney allegedly entered a curve too fast and came upon a large (also south-bound) white utility truck driven by Joseph Gunnels, 28, of Livingston. Gunnels had slowed down so that he could turn into a residence located off 1276. Matney was coming too fast and cut left to avoid the truck, but still clipped the heavy duty back bumper on the driver's side of the utility truck. 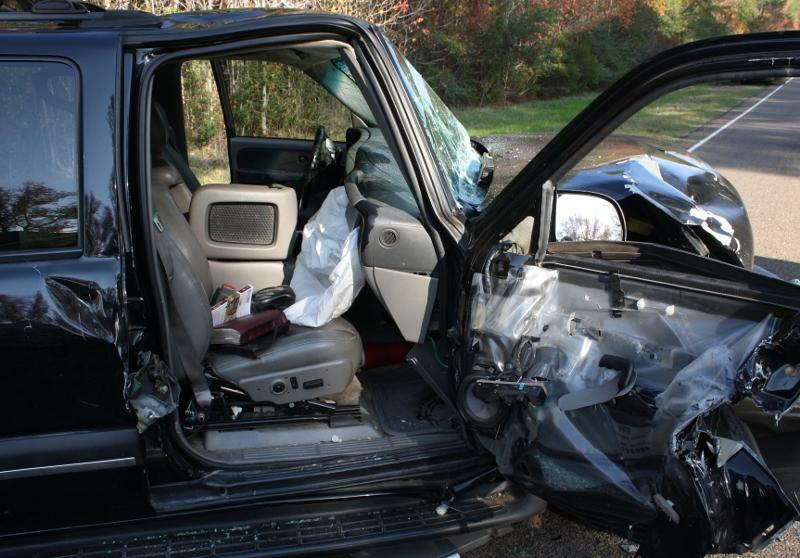 The collision crunched in the front passenger's side of Matney's Suburban as the vehicle slid partially off the road to the left of the pavement. 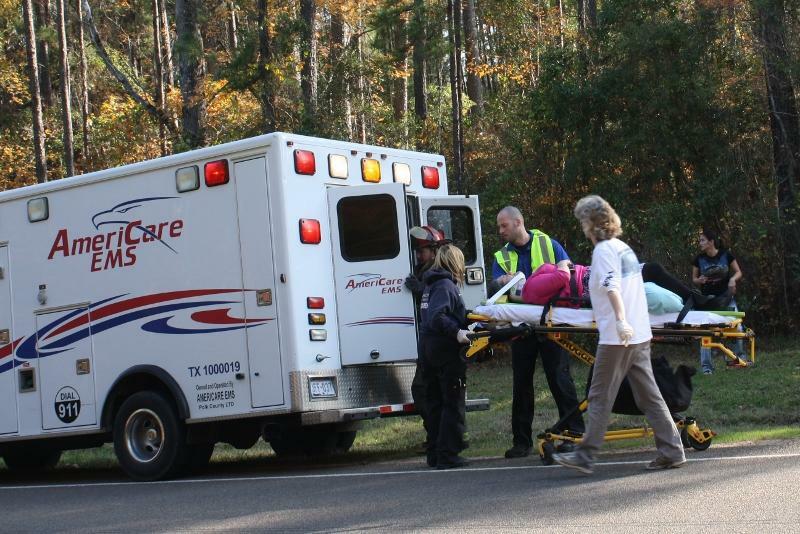 Americare Ambulance Service was dispatched to the scene along with the Livingston Volunteer Fire Department Heavy Rescue Unit, Deputy David Ramsey of the Polk County Sheriff's Office and Sergeant Rob Thomas and Troopers Joe Cole and Donny Akers. 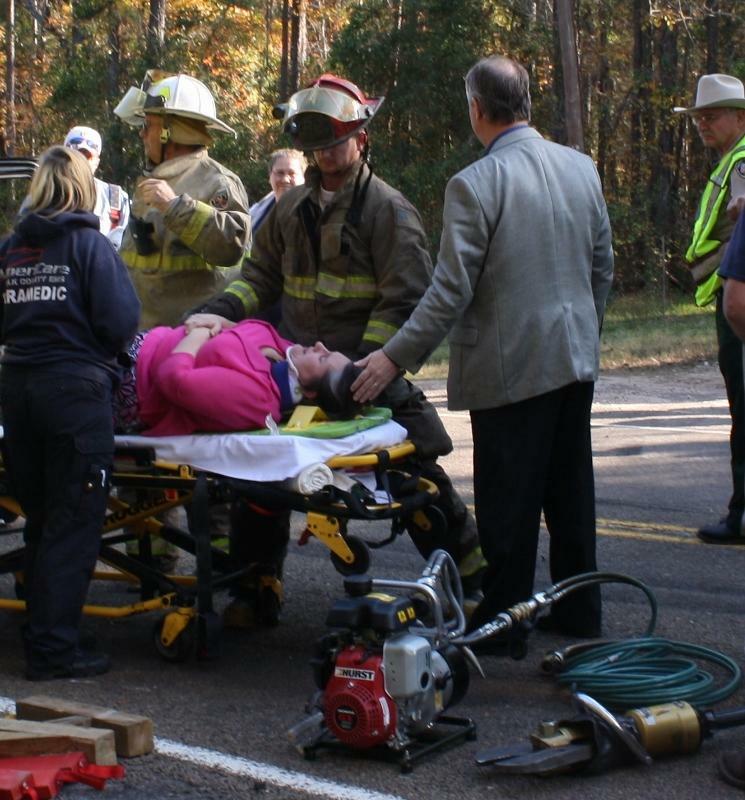 Matney was okay and got out of his vehicle, but his wife in the passenger's side front seat was trapped where the vehicle struck the utility truck. 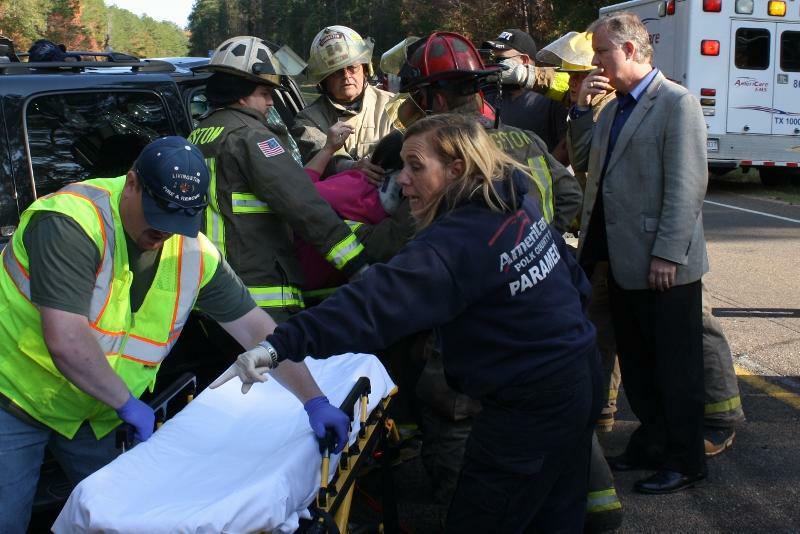 Firemen used the jaws-of-life to get the jammed door open to free Matney's wife. 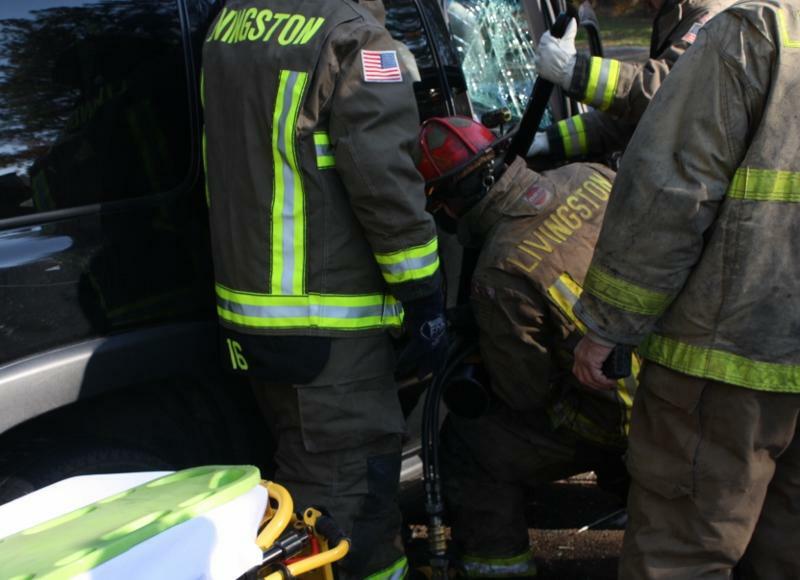 She was loaded onto an ambulance and transported to Livingston Memorial Hospital with undisclosed injuries. Traffic was partially blocked during investigation and cleanup. 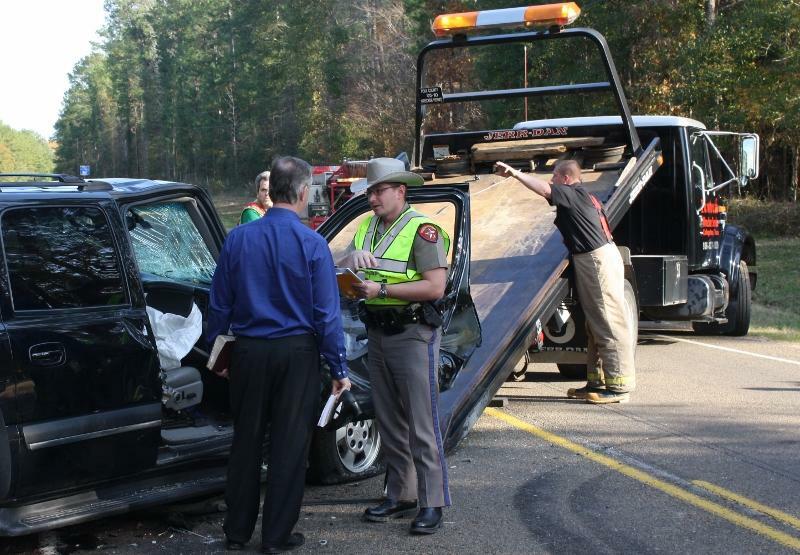 According to Trooper Cole, Matney was cited for failure to control speed. 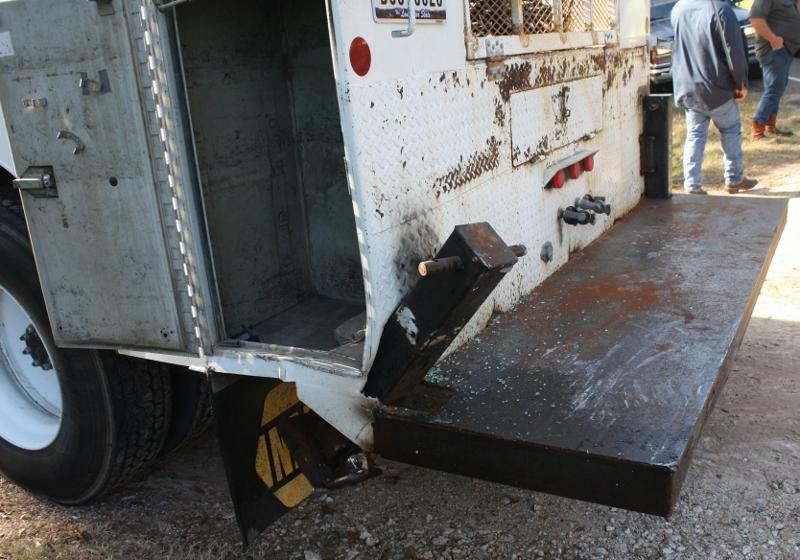 A rollback wrecker from Fawbush Wrecker Service recovered Matney's vehicle and it will be stored in Goodrich. The scene was cleared by 3:15 pm. Kenneth Matney's wife is trapped in his 2003 Suburban as firemen wait for the arrival of the jaws-of-life to get the door open. 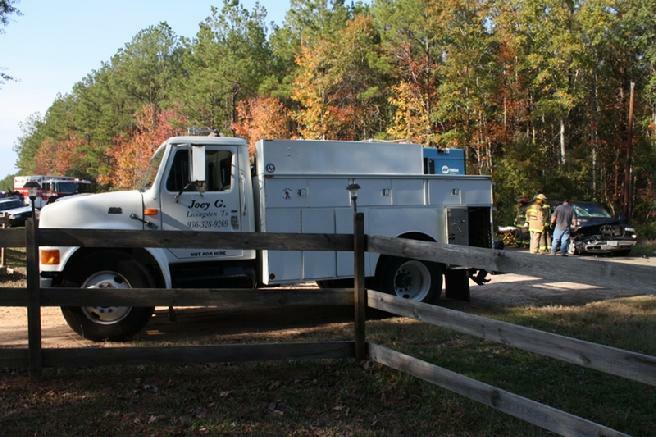 Damage to the utility truck was minimal. Firemen use the extraction equipment to pry the door all the way open. 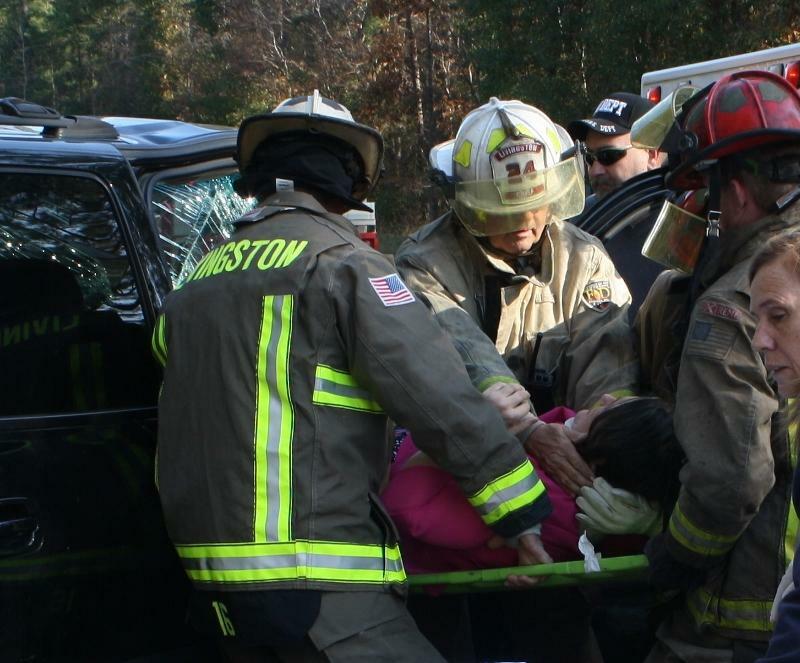 Livingston Fire Chief Corky Cochran (center) helps stabilize the passenger on the body board. Kenneth Matney places his hand on his wife's head apparently help comfort her. Kenneth Matney's wife was loaded onto an ambulance and rushed to Livingston Memorial Hospital with undisclosed injuries. Matney's vehicle was recovered by Fawbush Wrecker Service. Trooper Joe Cole speaks with Matney.